September 2006 – Taipei, Taiwan – If you are a fashionable enthusiast, you will be drawn in by the extraordinary elegance the Soprano VX irradiates. 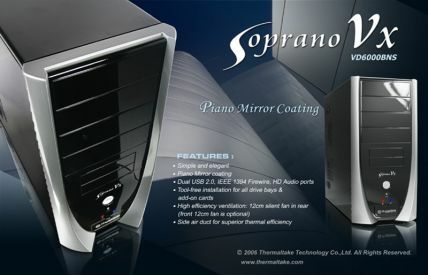 Thermaltake Technology’s new Soprano VX chassis utilizes the full mirror finish and generous curves in its design. The chassis retains the flavor of the original Soprano, and the curves of the door-less design illuminates an aura of pure innocence. The Soprano VX looks simple and clean, but its features are more and stronger than ever. The four 5.25” bays, two 3.5” bays, two USB ports, and a set of front HD(High Definition) Audio/Firewire connectors makes everyone’s life easier than ever. The side panel features a locking mechanism and thumbscrews for easier maintenance and installation. The Soprano VX is entirely screwless when it is taken apart. The 5.25” drive bays, 3.5” drive bays, HDD bay, and the rear PCI slots can all be installed without using screws. The Soprano VX has a 120mm fan installed in the rear for cooling the system silently. The side panel has a fan duct to concentrate the cold air from outside the system onto the CPU directly. The side panel also has many ventilations built in to ensure that your video card is sufficiently cooled and that the system remains stable. Do you want an elegant yet simple computer chassis? The Soprano VX simply stands out from the competition.